1. 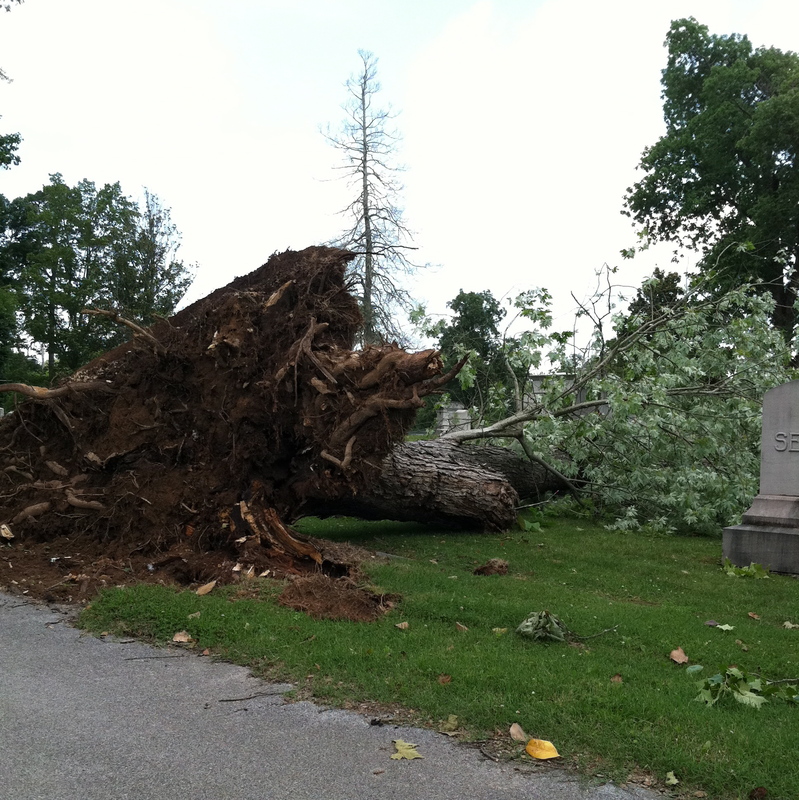 East Tennessee has been battered by a series of vicious storms. Rain, winds upwards of 60mph, trees falling on power lines, power outages for half of the county. A co-worker who lives in our area lost everything when a giant tree fell on his house. A sliver of our fascia blew off. Our patio furniture was blown to the other end of our lawn. All of our trees are still standing. We are the lucky ones. 2. We celebrated Bean’s first birthday last weekend, driven inside by the storms. We had a packed house crawling with family and friends eager to joyfully celebrate our baby girl. We ate, we laughed, we ate some more, because I made no less than three strawberry-themed desserts, we rejoiced in togetherness and frosting faces. We are the loved ones. 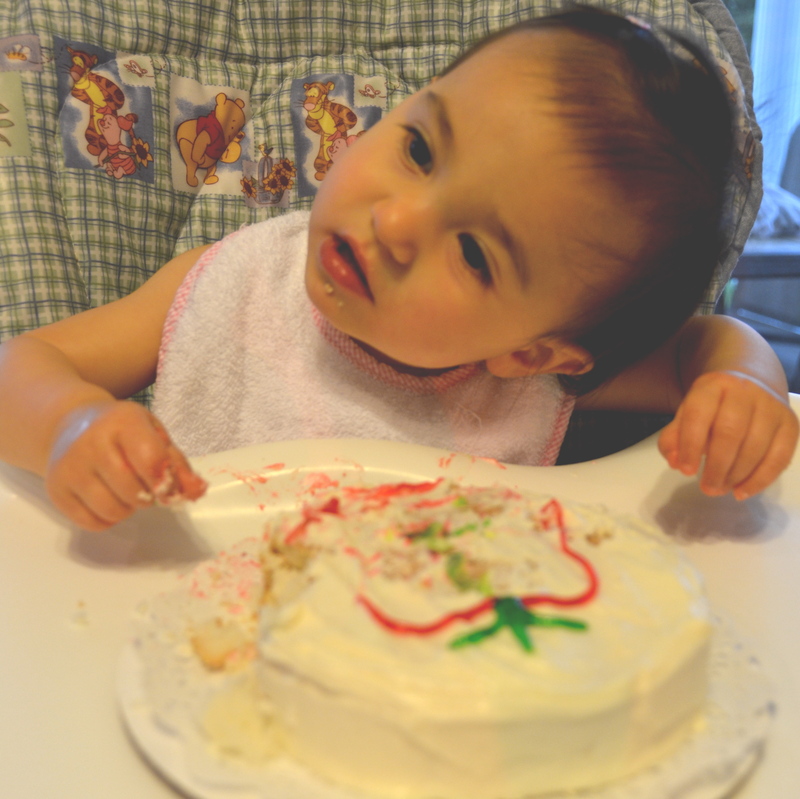 She was trying to hug her cake. What. I hug desserts too. 3. Our church held their Vacation Bible School this week, and, still relatively new to the congregation, I decided to help out. Bug and I made new friends, learned Bible verses, new songs, and the artistic value of shaving cream. We were greeted by name by many during the cookout celebration held beneath an overhang to escape the rain. We are the accepted ones. 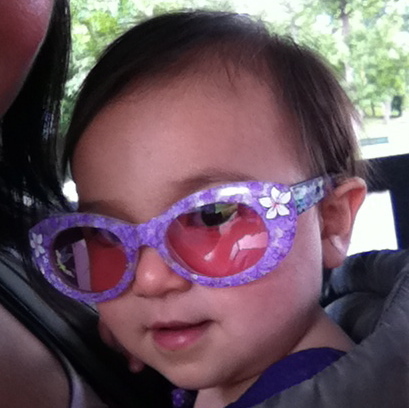 Sporting sweet shades at the church barbecue. 4. Bug was also invited to another VBS at a nearby church that ran during the evening. We came home from our VBS, ate, rested, ate, and ran off to VBS part 2, where he could spend more time learning about God next to his best friend from school. The laundry pile is the size of a small country, we went through more gas this week than I do in a month, we have bags and bags of art projects, we are looking forward to an uneventful weekend. We are the exhausted ones. I wish I could sleep this hard. We got hit by storms like that last year and had the opposite effect. The neighborhood was okay and all these massive trees fell down in our yard! The house was on the news. Good to hear from you on the posting tip. Still looking for Fatima and Uncle Cleatus? Whoa, summer of destruction has taken on a new meaning. Our friend’s story was in the paper, too. Did you miss me? Seriously. If I were a lender, and I had lent a dolphin named Fatima and a koala named Uncle Cleatus to you, and charged you interest for the amount of time you were borrowing them, I would be rich. Happy belated birthday to Bean. She looks smashing in those glasses. Love that Bean. Glad your house is okay. And happy “birth” day to you, my friend! Thanks, we are really one of the lucky ones in our area – we live in a heavily wooded area with lots of giant, old, beautiful oak trees. Driving to and from the library yesterday two miles away, I noticed everyone’s curbsides were lined with chopped up trees. Can’t wait to host Thing 1 & Thing 2! Check your email! Anyone who doesn’t like to hug dessert is suspicious in my book. So I say cheers to baby Bean who is growing up so quickly; and beautiful like her mother. I love being loved, accepted and exhausted (when the reason is good). So XOXO to you all. I adore you. And desserts. 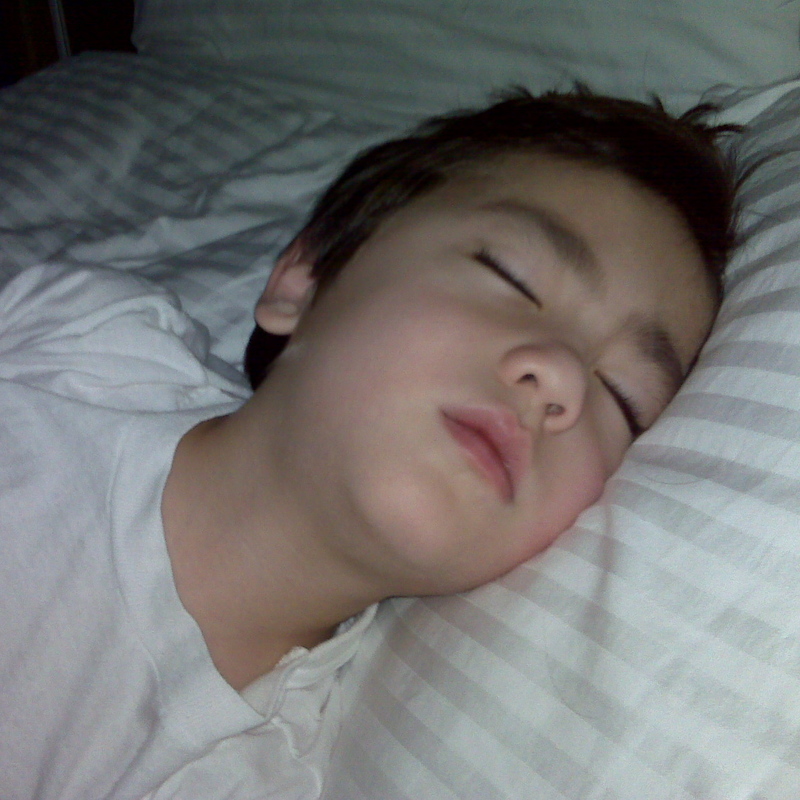 I miss sleeping like that. Maybe when I can’t sleep it would make me feel better to wake my kids up while they’re sleeping. That always makes me feel better.